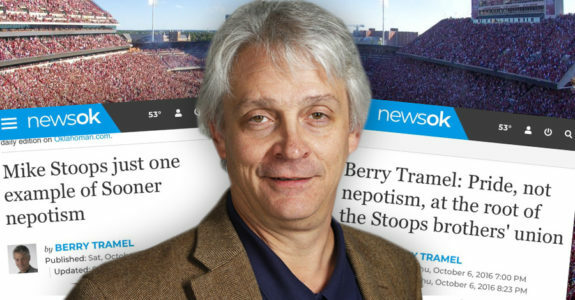 Like most sports-obsessed, Oklahoma born and raised GenX-Millenial hybrids, The Oklahoman’s Berry “Boomer” Tramel used to be required reading for me. Complete with folksy metaphors and a down-home vocabulary, his sports columns were almost always well-informed, insightful, and persuasive enough to either shape your opinion or change your mind. Over the past decade or so, that’s changed. Around the same time Berry ventured into sports radio and NewsOK videos, the quality of his columns went downhill faster than The Oklahoman’s advertising revenue. The informed, insightful and carefully crafted opinion pieces were replaced by mailed-in hot takes, contrived feuds with athletes, and superior command of the obvious opinion pieces that Jenni Carlson would applaud. Worst of all, he started writing travel blogs. The things people will do for a tax write-off these days are embarrassing. You can call it nepotism, and the problem with nepotism isn’t always hiring a family member who can’t do the job, it’s the reluctance of replacing a family member who no longer is getting the job done. But certainly no one was calling it nepotism when the Brothers Stoops were a charming tale in Soonerland. Two tough-and-rumble Youngstown, Ohio, brothers restoring Oklahoma football to greatness. If you didn’t call it nepotism then, hard to call it nepotism now. If you didn’t break out the law books then, don’t break out the law books now. Now here’s a snippet from the article that was published this weekend. It’s titled “Mike Stoops just one example of Sooner nepotism.” It runs through all the nepotism in the OU athletic department. Firing Bob Stoops’ brother was not easy for Lincoln Riley. You can understand that. Not just that Riley and Mike Stoops were friends. Not just that they had been through a lot together. Not just that coaches are a part of a natural fraternity. But firing the brother of the man who did so much for your career had to be excruciating for Riley. It was a mess not of Riley’s making. Nepotism, the practice among those with power or influence of favoring relatives for jobs, is alive and well in OU athletics…. All universities are better served if they don’t give in to the temptation to placate coaches who want to engage in nepotism. Wait a second. In 2016, Berry told us it was “Pride, Not Nepotism.” Fast forward two years, and now it’s “just one example of Sooner nepotism.” I’m confused. It’s almost like Berry is contradicting himself in his mailed-in sports columns. I don’t have a problem with people changing their mind or opinion, but at least admit when you were wrong. That would be almost as hypocritical as me complaining about Berry Tramel engaging in feuds and mailed-in hot takes when I engaged in feuds and mailed-in hot takes! Oh well, at least unqualified people who owe me their career haven’t dubbed me the voice of the state…. yet. Wow. That’s some real Woodward and Bernstein stuff there. You found a sports columnist who’s contradicted a past statement. Next you’ll tell me President Marmalape is a proven liar. The media in this state have a tangible fear of criticizing anything Sooner…Nepotism or not, Dude can’t get the job done…Next man up. And as a Cowboy, starting to throw some heat towards Stillwater, as well…Let a pretty good Defensive Coordinator go only to see a new hire coach a defense that couldn’t stop a runny nose. I’m tail-end Gen-X, and agree about Tramel’s early work. Hate to say it, but he’s kinda turned into the diet off-brand cola version of Skip Bayless lately, and that’s sad, as I’m sure he knows his stuff and genuinely cares about the state’s sports teams. I never liked Trammel …. He’s been pulling this crap for years. Look at some of the columns from 90’s and then he will reverse himself 2-3 years later. I agree the already questionable quality of his work has gone down hill the last few years. The guys always been an over opinionated hack. I think it’s fitting he’s on the Total Dumminance hour with Jim ‘XXL-ExpandomaticWaistband’ Traber and Al ‘Where’s the Thai strippers’ Esback. That tells you all you need to know.